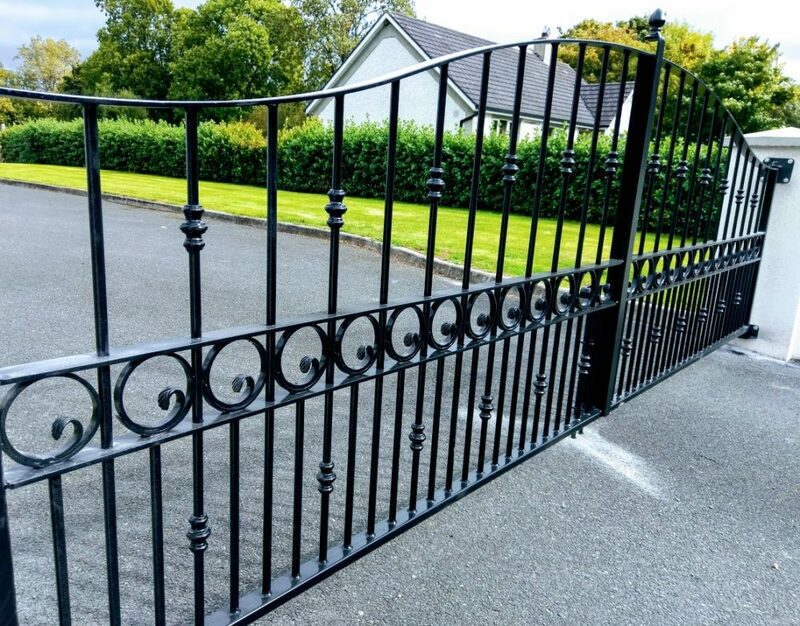 So today we were in county Waterford to fit a set of wrought iron gates for a client.We had previously visited this house and had a long discussion with the client about the style of gates to be fitted.The client had done a lot of research and had decided on this particular design for her gates. Its always good to deal with people who know what they do or don’t like,and who can also recognise the quality and workmanship of a particular set of gates.We were also fitting a Faac overground automation system and keypad. After our initial visit where we took measurements and levels, we went back to our workshop and began fabricating the gates.Once we had them fabricated, they were sent to be galvanised.This is one of the most important aspects of gate fabrication as the galvanising process prevents the future rusting of the metal.Once we got the gates back from galvanising, we then thoroughly cleaned them down and coated them in the chosen color. We then fitted the gates and commissioned the automation system,using our P.S.A. Licensed installers.It is a legal requirement to use P.S.A. 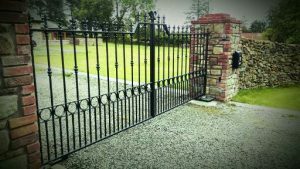 Licensed installers to commission automation systems.The client was absolutely delighted to come home and find her gates fitted and her automation system completed.On to our next job which is a beautiful set of wrought iron gates in county Kilkenny. I called to them one evening and measured the existing entrance. As they were thinking of installing electric gates I had a look at their options for power supply and intercom cable access. I then explained their options for either an underground or overground automation system. We only use Faac automation systems, as we have found after 10 years of installing these, they are by far the most reliable gate automation system on the market. We then went through the design of the steel entrance gates they had in mind. Pat and Carmel had a few ideas of their own, for wrought iron garden gates,which is something we always welcome.After looking through our album of gates, we were able decide on the below set of steel gates. The clients originally had wooden garden gates,but as everyone knows,our climate is just not suited to wooden gates.Their original wooden entrance gates only lasted around 6 years.All our steel gates are hot dipped galvanised and rust free for at least 50 years.We have a range of solid gates in which we fit maintainence free, timber effect, p.v.c., in a galvanised frame. I gave the clients a completion date of 2-3 weeks, and left to start work on their gates. We fit the gates and commission the gate automation system ( we always use a Faac System) all on the same day, so there is a minimum of fuss. 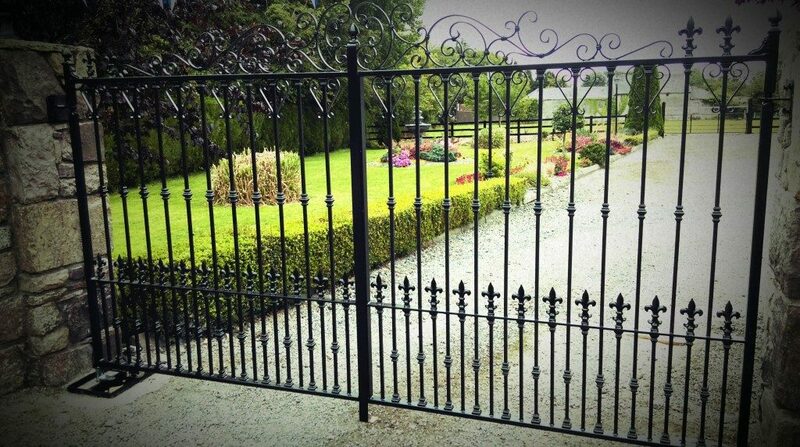 Pat and Carmel are delighted with their new gates and we are happy knowing we have 2 more satisfied clients. So, on to our next job a tricky automated cantilever gate in Co Tipperary. A Cantilever gate is a sliding gate that is mainly used for a wide entrance, or where there is a fall in the ground between the piers. 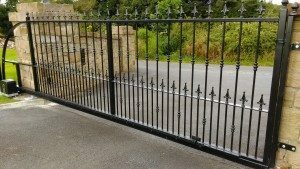 This blog entry is about a house entrance we installed an Electric Sliding Cantilever Gate on in Co. Tipperary..
We had done a site visit and met the owners, Sharon and Mike, 3 weeks previously. On our first visit I straight away saw a number of issues that were going to cause some difficulties. Sharon informed me that, they had had 2 other gate manufacturers visit and both said it wouldn´t be possible to fit an entrance gate to their entrance, as there was quite a rise on the driveway and because the driveway veered sharply to the right, immediately after passing the right hand side pier. It had been suggested to fit a set of wrought iron entrance gates, and automate them out,instead of in. This is always a very last resort,as electric gates and electric gate systems are all designed to open in,for good reason. The main reason it doesn’t work, is that if someone drives up to your entrance gates it means they can not open out. I proposed fitting a Cantilever Sliding Gate,with a Faac sliding gate system fitted to it. The cantilever Gate System does not require a track on the ground to run on,instead in runs on a system of wheel carriages,located behind one pier. It is ideal in a location where standard driveway entrance gates wont work. While Sharon and Mike didn’t fully understand the mechanics of the cantilever gate system,they were relieved to hear that We had fitted many of these systems and that we would 100% stand over them. We fitted and automated their electric sliding cantilever gate today. Everything went perfectly. We used the 24 volt Faac sliding gate motor and fitted a GSM Intercom and Keypad. The GSM Intercom allows the Client to answer the intercom from anywhere,worldwide, and also to control access to their gate. Sharon and Mike were delighted to return from work to find their new entrance gate not just fitted,but also the automation fully completed. 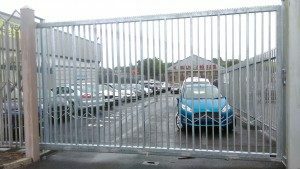 While they originally had some concerns about the possibility of ever getting a gate to work on their entrance ,they were delighted that we had come up with the perfect solution. 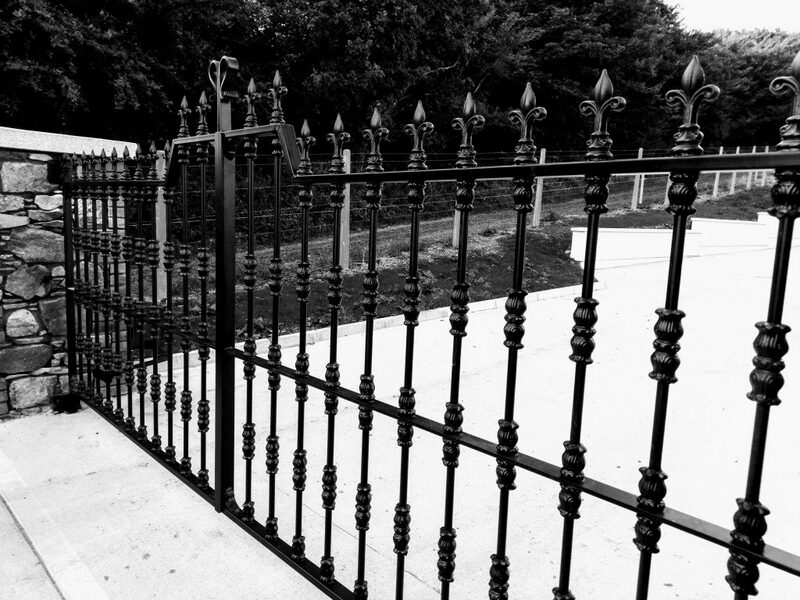 This is the benefit of using a gate company that has so much experience. 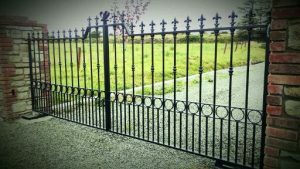 You can view a video of this gate on our facebook page Classicgates Waterford. So on to our next job,another sliding gate,this time clad in wood effect Pvc, in Co Wexford. Today we were in Waterford to fit a set of Wrought Iron Entrance Gates at a newly built house.We had visited this house previously . 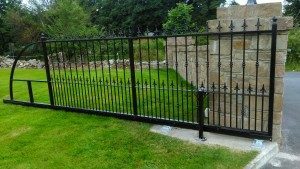 The clients had been trying to decide between electric, wooden entrance gates or steel entrance gates,they finally decided on a set of wrought iron electric gates, finished in black,as they didn’t want to have any future maintainence issues with the timber gates. Some people refer to automated gates as electric gates but we know what they mean when they say this. We had recommended using a Faac underground automation system,with a G.S.M. Intercom .The first step was to fit the foundation boxes for the automation .This gives us our levels and entrance width.It is vital that these foundation boxes are fitted correctly,as this insures the system will work properly. Once We had this done We went away and fabricated the gates,got them galvanised to prevent future rusting and then coated them in the agreed black finish.We fitted the gates and completed the automation all in the same day.The Faac automation system works perfectly with this type of gate and is well capable of operating without any problems. The clients were delighted with the gates and automation system and were very happy to recommend us.This is the most important issue for Us as We love to get new work from people who are referred on to us from people we have worked for in the past.